Poised and dynamic, the harm of Claudia is where to hide and where to reveal. 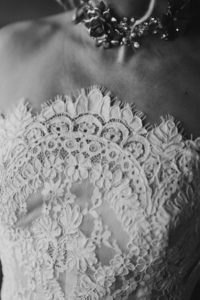 The bodice has a subtle high neckline that has bee made from floral beaded lace ( wait until your see it) and is balanced by capped sleeves. The daring split works in harmony with the tulle bare back.